The platinum group metals are getting a boost due in large part to Chinese stockpiling. According to reports, the stockpiling is part of China’s response to trade war threats with the U.S. and an expected ramp up in automobile production in the years ahead. Turning to gold, the yellow metal currently trades at $1,201 after staging a weekly advance of 0.5%. And finally, silver is up 2.0% on the week to bring spot prices to $14.39. It wasn’t a pretty summer for silver bulls, but market conditions appear to be improving – especially when measured by demand for bullion. Orders for Silver Eagles are surging this month as the poorly run U.S. Mint tries to keep up with a modest uptick in demand. Earlier in September the Mint had to temporarily suspend sales because government bureaucrats poor planning caused them to run out of inventories. Even so, the Mint has already sold about 2 million Silver Eagles so far this month. Although current retail silver coin demand is still well below levels seen several years ago, it’s already the biggest month for Silver Eagle buying since January. As the world’s most popular and widely recognized silver coin, the Silver American Eagle is a good bellwether for investor interest in silver overall. Following the summer doldrums, bargain hunters are re-entering the market. Investors would be hard pressed to find any other asset that is as compelling a bargain as silver at these levels. Silver prices entered the week at a multi-decade low versus gold. Silver trades at its lowest level versus the Dow Jones Industrials since 2003. Whether a major bottom has been reached will have to be proven out in the weeks and months ahead. But investors who have a long-term perspective can buy silver here knowing it’s one of the rare times in history when it can be obtained at such a deep fundamental discount. When you buy low, you set yourself up to one day be able to sell high. There is also a pride and joy that comes from ownership of physical bullion that you just don’t get with paper assets. Silver in particular comes in a variety of fun and unique forms. Of course, there are the standard one-ounce coins such as the popular Silver Eagles and Canadian Maple Leafs. There are privately minted 1-ounce rounds for those who prefer to save a little on premiums. There are bulky bullion bars for those who want to stack large amounts of wealth in single units of silver. And there are the unusual conversation pieces that you may want to proudly display or give as gifts. One of the most interesting and unique ways to invest in silver bullion is with pure silver bullets. Money Metals Exchange now offers replica bullets, made of solid .999 pure silver and in a variety of sizes, commemorating the Right to Keep and Bear Arms. The bullets also honor the timeless value of precious metals as real money. You can join both foundational values together by adding your choice of our beautiful “silver bullets” to your metals stash. Our .999 fine silver bullets come in five popular sizes from one ounce up to 25 ounces each. Our 1-oz silver bullet is modeled after a .45 caliber round of the famed Colt 45. The 2-oz after a .308 rifle round. The 5-oz after a 12-gauge shotgun shell, while the 10-oz is modeled after a .50 caliber Browning Machine Gun. And the impressive 25-oz bullet is a replica of a 20mm cannon round. A bullet represents the power to uphold justice, stop a threat, and protect your life and property. Owning silver can help you fight the injustice of the Federal Reserve System, mitigate the threat of inflation, and protect your personal wealth. Collect them, display them, or use them to start a conversation about two vital American traditions – the right to keep and bear arms and honest money. Choose your favorite – or grab a few of each to add to your personal arsenal of precious metals. Well now, without further delay, let’s hear this week’s exclusive interview with the man who famously advises people to have always have guns, gold and a getaway plan. Mike Gleason: It is my privilege now to welcome in Gerald Celente, publisher of the renowned Trends Journal. Mr. Celente is perhaps most well-known Trends forecaster in the world, and it's always great to have him on with us. Gerald Celente: I absolutely share that. Because I mean, here's the deal. If your or I were to do business and I'm making $350 billion more than you are, are you going to want to renegotiate this? Hey listen, something's wrong over here. So, when you look at even with the tariffs that Trump is putting on, that still amounts to a very small percentage of China's GDP, about 0.3%, or something like that, 5%, 6% tops. So China's going to negotiate. They're not going to give up a very lucrative business deal, so they could keep making more when the other business partner wants a better share. Mike Gleason: And how do you see the escalating tariffs impacting markets? So far the response appears mixed. The dollar seems to be benefiting, and metals are suffering. We aren't sure the markets have it right when it comes to the dollar though. It seems to us that tariffs should drive price inflation. Either Americans pay a higher price for the imported goods, or replace them with more expensive domestic products. And the Chinese aren't likely to be buying as many dollars or treasuries if exports to the U.S. fall – to say nothing of their ability to wage and all-out currency war against the dollar. But so far, at least the dollar is getting stronger in foreign exchange markets. What are we missing? Gerald Celente: Well, I think what people are missing is they're making too much of a deal of the trade war. It's every day. It's almost become stupidity with the business media. Every day they're going, “the market goes up because trade wars eased. The market’s down because trade fear is increased.” I mean, come on. What are they kidding? I mean, the world is bigger than that. Even what you saw car sales start slumping in China, the headlines blamed the trade wars. Does the average person give a damn about a trade war? They're buying what they're buying, they got what they got. If they don't have it, they don't spend it. If they have it, they spend it. They don't know what's going on behind the scenes and the details of a trade war. The media has dumbed down so much… it's every day. It's one excuse. And as far as the dollar going up, it's interest rates. I mean, the United States is raising interest rates. You're looking at what, even with the United States raising interest rates, what are you looking at the overnight, the Fed funds rate? 1.75 to two? And what is it 1.5 in Canada and the U.K. Negative interest rates in Europe and the European Union. Negative in Denmark. Negative in Sweden. Negative in Japan. I mean, it's ridiculous. So what I'm saying, Mike is that the markets cannot take a rate increase. That's why the currencies are going down. And matter of fact, we just heard from the number two guy in China, Lee, saying that to think that the Chinese, he said, want to devalue our currency is ridiculous. He said we're not going to make up that much more trade on having our currency decline. Because by the same token, you look at China, what are they the largest importer of energy in the world? And now the Yuan is going down, and oil prices are going up. Oh, and what are oil prices based on? Petrodollars. So now as their currency declines, they got to input more energy. And it's based in dollars, as the dollar gets stronger, they don't want this to happen. So to me it's a lot of misinformation out there. And again, I'm no Trump fan. I mean, I think the guy is ridiculous on a lot of stuff. But the media is so anti Trump that they'll keep using one play a day, and overlooking the bigger story. Mike Gleason: Prior to the 2008 financial crisis, the emerging markets were the ones who were hit first, and that rolled over to the U.S. Today we're looking at a potential repeat, and the strong dollar has the potential to really hurt emerging market economies… you just alluded to that in your previous answer. Is that the trend you're watching most closely here, Gerald? The health of the emerging markets as potentially the first domino to fall, that leads us to the next economic crisis, perhaps? Talk about that. Gerald Celente: The emerging markets are the symptom. Again, the cause is a dollar. The dollar has no competition. As I mentioned, you're looking at negative interest rates in Europe. The dollar gets stronger, it's not because things are so great. Where, what do we have? A $21 trillion debt over here. And when you put the real debt levels into it, it's over 200 trillion. Social security pensions, et cetera. So the reason the dollar is getting stronger is the Fed's raising interest rates. The world cannot take rising interest rates, because the whole recovery was built on cheap money. So what we're saying is that, when the Fed raises interest rates too much, when emerging markets currencies slump too low, that's the implication, the symptom of the cause. And that's going to bring down, that's going to be the contagion. Another one, look at the Indian Rupee. It's at an all-time low. Fell 14% this year against the dollar. 80% of the energy is important in India. So now you're looking at a declining currency, oil prices going up, and a slowing economy. So now what we're looking at is oil. Oil and interest rates. The ratcheting up of war in the Middle East, you just saw what Israel, a release came out last week that they've sent it over, something like 800 missiles into Syria over the last year, according to their intelligence agency. Several hundred. I'm not sure the exact number, I forgot it. And then what happened with the Russian plane just getting shot down, as Israeli jets were allegedly firing missiles into Syria, and the Syrians shot back and they also hit the Russian plane, killed 15. And then there's the sanctions going on against Iran. And that's going to drive oil prices up even more. Here's what we're saying, if oil prices hit a $100 a barrel… and now they're floating around the $80 mark… you go back to the last five recessions, Mike, all of them were preceded by rising oil prices. I just put the whole scenario together, with the rising value of the dollar, the more it's costing them to buy the energy. So now, with sanctions going on in Iran, and supposed to be taking very full effect in November with the oil sanctions, that's going to cut back on supply. And the word has it, from what I'm reading, is that OPEC and non-OPEC nations, including Russia, Saudi Arabia, and the United States… OPEC of course is Saudi Arabia, but the United States and Russia aren't… they're not going to be able to make up the loss for what they're going to be sucking out from Iran. That's going to drive prices up higher. So that, plus war fears, plus rising inflation, then we're saying gold is the ultimate safe haven asset. And you well know we've been saying, well over almost two years, that gold's bottom is around where it is now, $1,200. Thirty, forty bucks one way or another. But this is what we've been saying. So, when these tensions heat up, that's when you're going to see gold prices spike. Mike Gleason: Getting back to the interest rates here for a minute, how do you see this battle between the Fed and Trump playing out? The President has been very critical of the Fed's tightening of monetary policy, and their decision to forge ahead with rate increases. Do you see the Fed digging in here as they try to assert their independence? Or do they end up caving in and going along with his preferences for low rates? Gerald Celente: It's hard to say, you go back in past years, Nixon administration, he pushed power onto the Fed to do what he wanted. So it's hard to say. You don't know it goes in on these deals. But what everyone should really recognize, is the failure of the Fed over the years. You talked before about the panic of '08. A term that I coined in 2007, took the domain name out. And I was going totally against what the Fed was saying. They were wrong on everything. And they're wrong now. And again, this country cannot take rising interest rates. Oh, I just mentioned rising oil prices, right? So now the tax cuts for the middle class in America, that Trump gave the middle class, half of them are eaten up already by rising prices at the pump. So what I'm saying is that, the Fed is overestimating the power of the economy. Real wages have only gone up because, you know why? People are working longer hours and holding more jobs. So they're overestimating the power of the economy. If they raise rates too much, it's not only going to bring down the economy, it's going to crash the markets. Mike Gleason: Getting back to metals here for a moment. It seems like right now all the winds are against higher prices. Interest rates are rising. Stocks are rising. The dollar is getting stronger, as we talked about, at least relative to other currencies. It would be hard to find a trader on Wall Street who is buying safe-haven assets right now. That's a tough combination for gold and silver bugs. But we know that all of these conditions don't normally go together. At some point you'd have to think that rising interest rates are going to cripple growth, as we talked about. And the risk is going to return to the markets one day. Do you see investors being given a reason to buy precious metals anytime soon? Or are gold bugs going to have to tough it out for a little while longer? 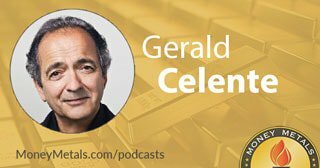 Gerald Celente: People playing the market, and people investing in gold are two different stripes. And I began my career back in the late 1970s, and very few people were doing it, trading gold. Then I became a buyer of gold. Rather than a trader. So if you're buying gold, it's for the long term. It's still the ultimate safe haven asset. We just ran through the currencies. The currencies aren't worth the paper they're not printed on anymore. I mentioned $250 trillion worth of global debt. So, gold – the people that buy it – and I don't give financial advice, I'm a trend forecaster… we're saying it's the ultimate safe haven asset. And there are very many good reasons to have that asset. Because again, yes, the strength of the dollar, but there's a whole world out there. And their economies are in very serious trouble among a number of nations. Again, you're looking at currencies hitting record lows against the dollar and/or back into very terrible territory. Look, if you lived in Argentina, what do you got? 65% interest rate charge. You lost 40% on your Peso in a year… what would you rather hold? Pesos or gold? Oh, it's expensive? Yeah. But you're losing money on everything. So, there's going to become a point when these currencies decline so much that people will do anything they can not to lose the value of their currency. And the smart money we believe is going to go into gold. Mike Gleason: That's a big reason why we like having you on, you have a global outlook. Obviously, there's a lot more going on than just here in the States. And that's a very important thing for people to keep in mind. It is a big world out there, and there's a lot of people that do still recognize the safe-haven value of something like gold. Now, as we begin to close here, is there anything else you're focusing on as we head into the November elections, and the final months of the year? Anything that you're keeping an eye on that maybe we haven't discussed, that need to be on people's radars? Gerald Celente: Yeah. We think that Trump is going to play another peace card, possibly with Afghanistan. We're going on, what? It's going to be a 18 year war. And no end in sight. And there's just a dump of money going into it. And also, probably pulling out of Syria, and more positive peace deal with North Korea. And we believe that's going to happen before the mid-terms to give the Republicans a boost. And he's even speaking out more and more about the useless wars in the Middle East. And matter of fact, that's the lead story in our new Trends Journal that just went out. And that it's America's love of war and hatred for peace. And how it's really hurting this country in so many different ways, financially as well as morally. They say the fish rots from the head down. So, if you have a leader that says Assad has to go. Qadhafi has to go. Hussein has to go. What's the difference from sick SOB in school saying, my classmate has to go. I mean, if I got some of you watching your leaders murdering innocent people that have done nothing to us, poses no threat to us. The only threats they said were based on lies that are “facts.” But of course the white shoe boys and the political criminals, now they get brought up on charges. They misspell the word justice, it should be just-us. Because we're the only ones that pay when we commit a crime. So, what we're saying is that, yes, we believe there's going to be a big play, and it's going to be a midterm play, and it's going to be for peace. Because most of the people, they don't follow the media lines, or the political lines. They only follow their heart and soul. And so, people really want peace, but the media and the politicians sell war. And Trump, as you can see by his comments, is not for it. So we believe that that's going to be a positive, and also that's going to be positive for equity markets as well. Mike Gleason: That'll be something worth keeping an eye on. Well, great stuff as always, Gerald. Thank you for your time. Now before we let you go, please tell listeners how they can get their hands on the great Trends Journal information there, and anything else that you're putting out at the Trends Research Institute. Gerald Celente: Well, the Trends Journal used to be a quarterly when we began in 1991. And now it's a monthly. And we also put out Trend Alerts each week. Trends in the news broadcast Monday through Thursday. And money back guaranteed. It's only $129. But it's the only place where you're going to read history before it happens. Somebody just bought Time Magazine and made a big deal out of it. Time Magazine, last week's news tomorrow. So what we're doing is we're giving you tomorrow's news today. Mike Gleason: Well thanks again, Mr. Celente. We always love having you on. Enjoy the beautiful fall weather up there. Have a great weekend, and I'll look forward to our next conversation. Take care.